Al Jazeera’s report on board the Mavi Marmara before communications were cut. Israeli forces have attacked a flotilla of aid-carrying ships aiming to break the country’s siege on Gaza. At least 19 people were killed and dozens injured when troops intercepted the convoy of ships dubbed the Freedom Flotilla early on Monday, Israeli radio reported. The flotilla was attacked in international waters, 65km off the Gaza coast. Avital Leibovich, an Israeli military spokeswoman, confirmed that the attack took place in international waters, saying: “This happened in waters outside of Israeli territory, but we have the right to defend ourselves.” Footage from the flotilla’s lead vessel, the Mavi Marmara, showed armed Israeli soldiers boarding the ship and helicopters flying overhead. The Israeli military said four soldiers had been wounded and claimed troops opened fire after demonstrators onboard attacked the IDF Naval personnel with live fire and light weaponry including knives and clubs”. Free Gaza Movement, the organisers of the flotilla, however, said the troops opened fire as soon as they stormed the convoy. Our correspondent said that a white surrender flag was raised from the ship and there was no live fire coming from the passengers. Before losing communication with our correspondent, a voice in Hebrew was clearly heard saying: “Everyone shut up”. Earlier, the Israeli navy had contacted the captain of the Mavi Marmara, asking him to identify himself and say where the ship was headed. Shortly after, two Israeli naval vessels had flanked the flotilla on either side, but at a distance. Organisers of the flotilla carrying 10,000 tonnes of humanitarian aid then diverted their ships and slowed down to avoid a confrontation during the night. They also issued all passengers life jackets and asked them to remain below deck. Al Jazeera’s Ayman Mohyeldin, reporting from Jerusalem, said the Israeli action was surprising. “All the images being shown from the activists on board those ships show clearly that they were civilians and peaceful in nature, with medical supplies on board. So it will surprise many in the international community to learn what could have possibly led to this type of confrontation,” he said. Meanwhile, Israeli police have been put on a heightened state of alert across the country to prevent any civil disturbances. Sheikh Raed Salah,a leading member of the Islamic Movement who was on board the ship, was reported to have been seriously injured. He was being treated in Israel’s Tal Hasharon hospital. In Um Al Faham, the stronghold of the Islamic movement in Israel and the birth place of Salah, preparations for mass demonstrations were under way. Condemnation has been quick to pour in after the Israeli action. Mahmoud Abbas, the Palestinian president, officially declared a three-day state of mourning over Monday’s deaths. Turkey, Spain, Greece, Denmark and Sweden have all summoned the Israeli ambassador’s in their respective countries to protest against the deadly assault. Thousands of Turkish protesters tried to storm the Israeli consulate in Istanbul soon after the news of the operation broke. The protesters shouted “Damn Israel” as police blocked them. Ismail Haniya, the Hamas leader in Gaza, has also dubbed the Israeli action as “barbaric”. Hundreds of pro-Palestinian activists, including a Nobel laureate and several European legislators, were with the flotilla, aiming to reach Gaza in defiance of an Israeli embargo. The convoy came from the UK, Ireland, Algeria, Kuwait, Greece and Turkey, and was comprised of 800 people from 50 nationalities. But Israel had said it would not allow the flotilla to reach the Gaza Strip and vowed to stop the six ships from reaching the coastal Palestinian territory. The flotilla had set sail from a port in Cyprus on Sunday and aimed to reach Gaza by Monday morning. Israel said the boats were embarking on “an act of provocation” against the Israeli military, rather than providing aid, and that it had issued warrants to prohibit their entrance to Gaza. 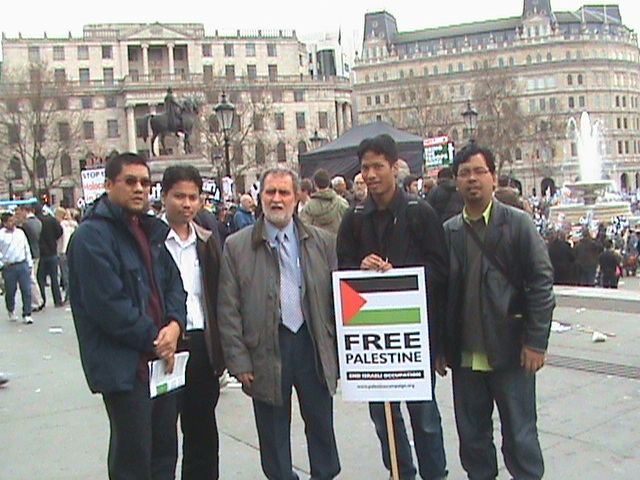 It asserted that the flotilla would be breaking international law by landing in Gaza, a claim the organisers rejected. (Note (s): What we can do besides our Doa’? I just received the news. It was totally inhuman of them! What the ZIONISTS did are not only inhumane, barbaric, uncivilized unbecoming, unaccepatable. nauseating…. rich Muslims are only thinking of enriching themselves and of all things wanting to stage the Olympics!!! The Zionists will perpetuate the kiliings and maiming of Palestinians whom they likened to Biblical Goliath’s Philistines.Ah , those gentiles that should be exterminated as instructed by their adulterated bible. This toying with the hapless Palestinians will continue as long as we are not committed to making Shariah a reality.We weaken ,damage and bleed ourselves to death with nonsensical episodes such as Blum v Dar, Dubai Nakheel, Sime Darby and countless others. Just blame ourselves, for the syaitans, Zionists are mere opportunists pouncing on our own internal misdoings and mis adventures.